It is supposed to look like a 308GTB but silhouttes can chnage! The heads don't look like 308 heads...because they aren't! This story is written by Graham Gauld and was originally published by VeloceToday.com and has been reproduced with their kind permission. Has anyone seen the Carma FF lately? Recently Martino Finotto died of cancer at the age of 80. He was a Milanese gentleman driver, his family fortune stemming from their pharmaceutical company. 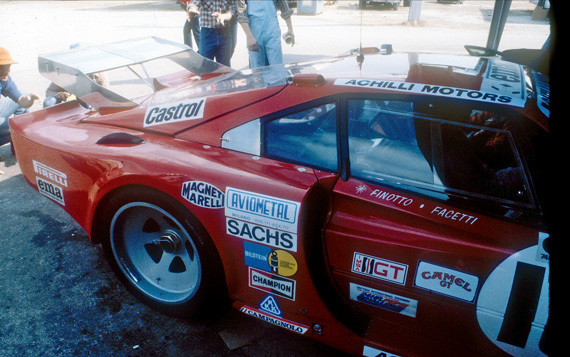 Finotto was the man behind various racing ventures with his business partner and racing driver Carlo Facetti. Together they ran Achille Motors in Milan where Facetti was in charge. Carlo Facetti is probably best known as a former factory driver for Alfa Romeo in T33s; he was a tough hard driving competitor and gifted engineer. Finotto was a good driver; good enough to win the 1979 European Touring Car Championship with a 3 liter BMWCSL, and had good connections in Italian motor sport. However, he is probably best remembered for his participation in the World Sports Car Championship in the early 1980s. 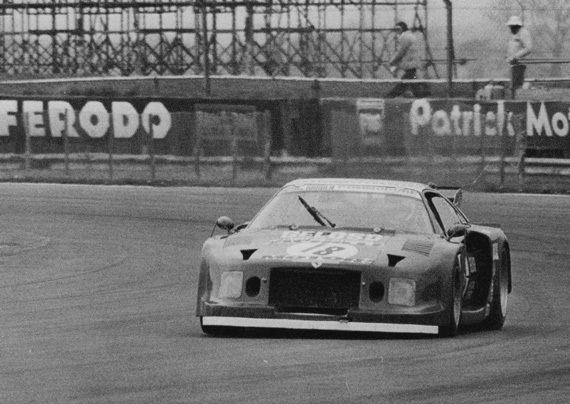 In 1980 Lancia sold him one of their brand new Lancia Beta Turbos the factory had been running in the championship, and Facetti and Finotto were able to add points to Lancia’s total. 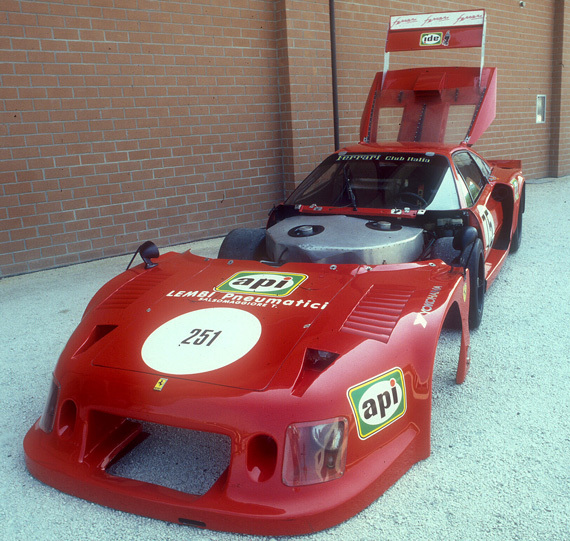 For the 1981 season the team came up with the idea of trying to challenge the all- conquering Porsche 935s with a Ferrari. Maranello was not interested in running a factory team in the championship as they were concentrating on Formula 1. Finotto and Facetti decided to take on the mantle even though their facilities at Achille Motors were hardly equal to Porsches. 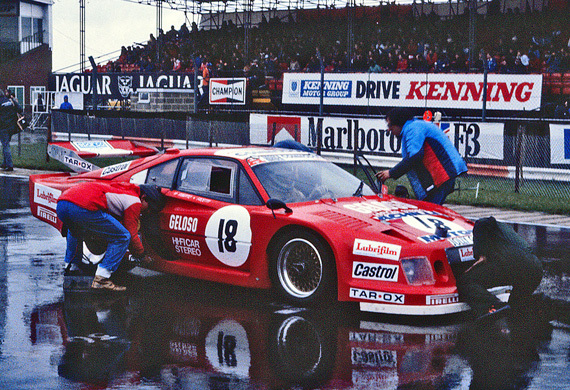 As their baseline they chose the 3 liter Ferrari 308 GTB and then proceeded to tear it apart. The Championship ran on a silhouette formula, which meant you could change a lot of things provided the car eventually looked roughly like a street model. They built one of them and ran it a few times before deciding to build the ultimate model, which they called the Carma FF (CARloFacetti and MArtino Finotto and the FF for Facetti and Finotto). 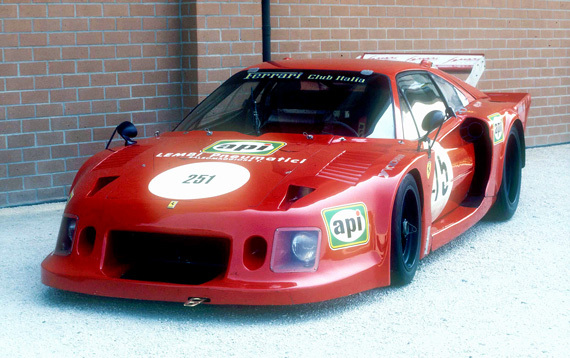 This car appeared for the first time at the Daytona 24 Hour race in 1981 and it was there that I first saw it. It attracted a lot of attention because it was a Ferrari. But one could imagine the thoughts of the Porsche mechanics when they saw this slightly bulbous Ferrari with some typical lumpy Italian welding and last minute changes. 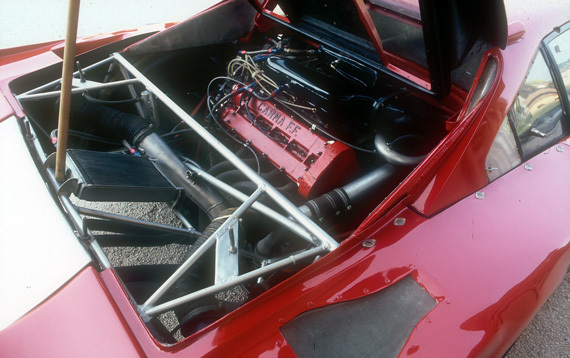 Clearly the street 308 GTB was not in the same league as a 935 so Facetti first looked at the engine. For a start he designed his own cylinder heads with the cam covers stamped “Carma FF” and added not one but two turbochargers and ended up with 700 bhp. 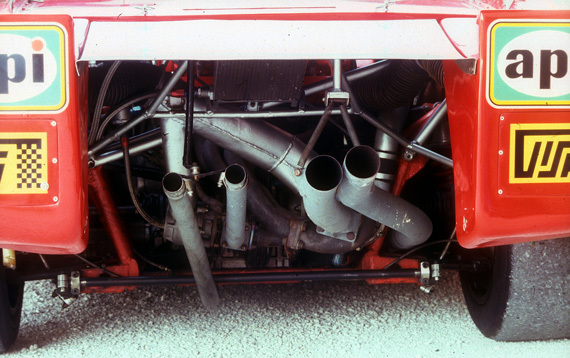 When it came to the rest of the car they threw away the front and rear subframes and went to their friend Giorgio Stirano, who ran Alba Engineering in Turin, to build them lighter subframes that were merged with the Ferrari center tub, which, if the truth be told, was the only pure Ferrari part of the car. At Daytona the car looked like a real Italian special that had been quickly painted and shipped to Florida. It was a brave decision to launch a completely new and untried racing car in a 24 hour event 8,000 miles from home. In conversation Facetti told me that despite the fact he had 700 bhp, he would be able to turn up the boost for qualifying and get 840 bhp which is exactly what he did. Facetti, always a brave and gritty driver, put the Ferrari in sixth place on the grid amongst all the Porsches and it raised a lot of eyebrows. However, it was also noted that Finotto had decided to ship his well-used Lancia Turbo for the race and gave a young Italian driver, Emanuelli Pirro his first-ever major sports car drive. 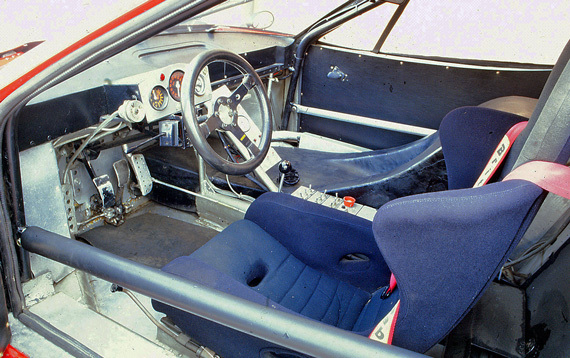 In true fashion Finotto and Facetti entered themselves as drivers in the Lancia as they intended to play musical chairs with both cars over the 24 hours. It was not necessary, for in the opening laps Facetti drove the Carma flat out, the car bucking and weaving on the banking, and set up the fastest lap in the race ahead of all the Porsches before it pitted after five laps and was out. One of the welds on an inlet manifold had cracked and the electrics had failed. However, as the car had got up to second place in a brief moment of glory, people began to notice. It would be nice to say that the Carma went on to greater things, but it didn’t. At Mugello it was running sixth when the electrics packed up for a second time and at Monza the tifosi were in raptures as brave Facetti put the Carma FF on pole position. Facetti was timed at 200 mph which must have been frightening. Then came desolation when the fuel pump gave up the ghost on the warm-up lap of the race and it was out. I was at Silverstone for its next outing where, in the rain, it looked even more frightening, but this time it was the gearbox that gave way. As anyone who watched this car in action would attest, it was a true animal to drive and the stylish Finotto was never able to wring the performance out of the car that Facetti could. Yet both must have feared the visit to the Nurburgring. It was no surprise when Facetti completely lost it and crashed. The car ran in just two other races. First, it was dragged down to Enna in Sicily where it was again on pole position but retired after three laps, and finally to South Africa and the Kyalami nine hour race. Second fastest in practice it expired once again. By now Finotto and Facetti began to look at the bills and the lack of results, and came to the conclusion that their twin turbo 308 experiment was too complex for a team with their resources. They never raced the car again. They did, however, re-join the Championship the following year, but this time with a more conventional Osella-BMW. Later they commissioned Giorgio Stirano to design and build the Alba which they raced. So what happened to the Carma FF? It was brought back to Italy from South Africa and put in the back of the shop in Milan. As I had always found the Carma a fascinating monster, I kept trying to find out what happened to it. Then in a conversation with Steve Griswold he suggested I contact Fulvio Visioli who ran Autovip that specialized in interesting cars. He in turn put me on to Rino Lembi who ran Lembi Pneumatici, a tire agency in the Italian health resort of Salsomaggiori in Emilia Romagna. Rino Lembi and his brother Walter are true Ferrari enthusiasts and welcomed me with open arms. And there in the garage was the Carma FF, looking pristine and in better condition than I had first seen it fifteen years before at Daytona. They pushed it out of the shop and started to take off the body panels so that I could have a look at it. The trouble the Lembi brothers had was that the car was basically ineligible for any of the historic races taking place at the time, as were the big Porsche Turbos, and so they were clearly looking out for someone to buy it. About ten years later it came up for sale at Coys auction linked to the Nurburgring historics but it did not sell and there, as far as I am concerned, the trail went cold. As VeloceToday has a worldwide readership perhaps there is someone out there who knows where the Carma FF lies now. It may have been the runt of the Ferrari litter and never won a race, but what an exercise coming from a small garage in Milan. It was an exercise financed by the elegant Martino Finotto, a charming and modest man which is why I have no photos of him. Maybe he did not set the world on fire but he and Facetti sure made a place for themselves in motor racing history with their one-off Special that gave the Porsche team their biggest fright back in 1981.